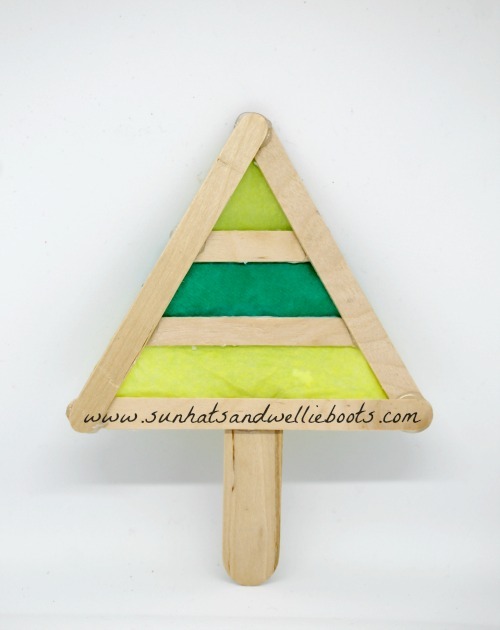 Looking for frugal & fun decorations for kids to make? 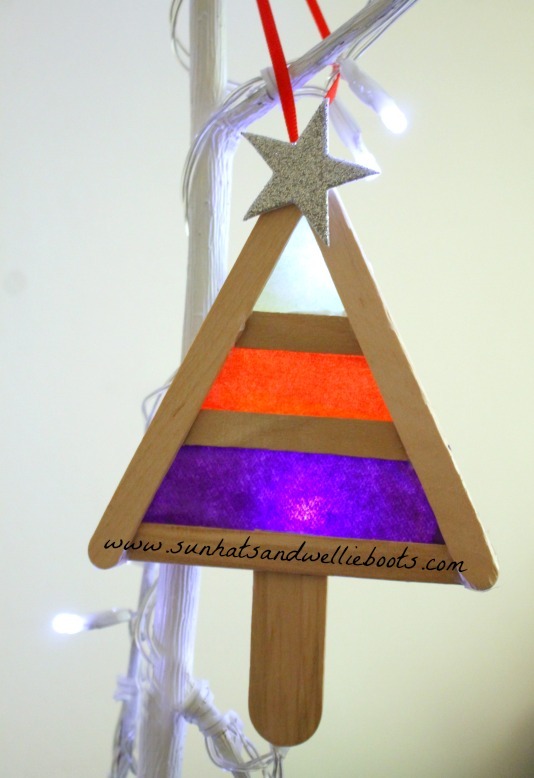 These stained glass Christmas Trees are simple & thrifty to make & look beautiful with all the Christmas lights behind them. I love a craft that uses up those odds & ends leftover from previous crafting fun & these trees do just that. 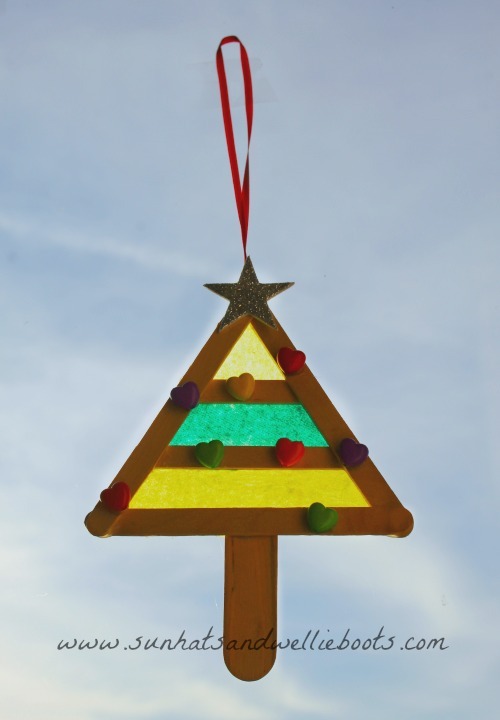 Each panel of 'stained glass' uses only a small amount of paper & the decorations for the tree can be made from any odd buttons or beads you have around. 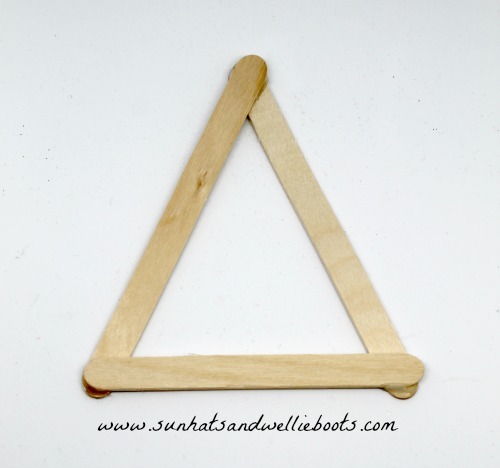 We started by making a simple triangle shape which we stuck together using a glue gun. 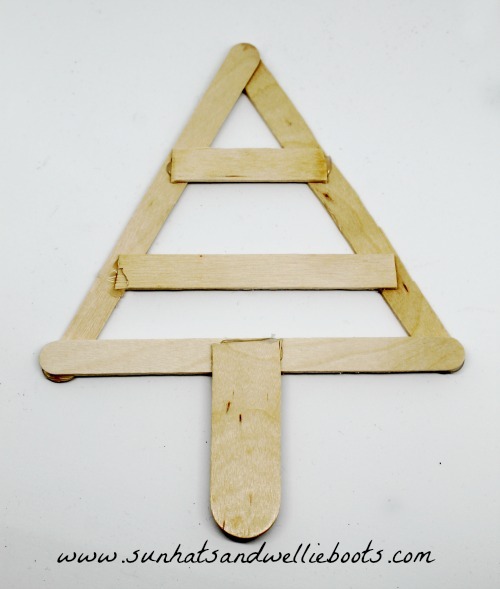 To create the panels inside the tree we cut the ends off two lolly sticks & glued the sticks across our triangular frame, securing them again with the glue gun. 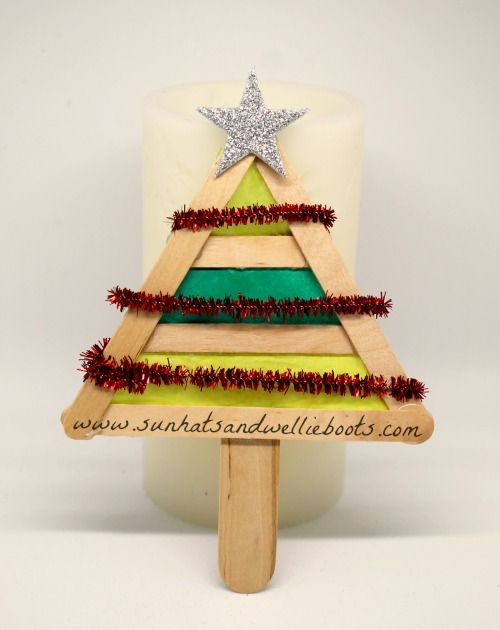 For our tree trunk we cut a small section of the larger lolly stick & glued to the base. (If don't have a larger lolly stick a section of thick card would work just as well.) Now we were ready to add our 'stained glass'. We had quite a collection of odd scraps of tissue paper & Minnie rummaged through the various colours to chose the ones she wanted for her trees. Before we added them to the sticks we roughly measured how much of the paper we needed & then cut out strips that would fit across the tree. Minnie used a glue stick to add glue to the 'rough' side of tree frame & then layered over her coloured tissue, trimming off any excess at the sides. What's great about this is that it doesn't really matter how you place the tissue paper on the sticks. You can use as many colours as you wish & layer them in different ways & the effect is always beautiful. When the tissue overlaps it creates new shades & colours which look so pretty with tree lights twinkling behind them. When we'd finished adding our tissue paper we stuck a star on the top of the tree & attached a length of red ribbon so we could hang our trees up. On some of the trees we added a few decorations using old beads, buttons & pipe cleaners. These small heart shaped beads which were £1 from Wilkinsons were so colourful & made great little baubles for our tree. On some we used a few odd pipe cleaners & wound them around the tree to create a tinsel effect. So simple but so effective. 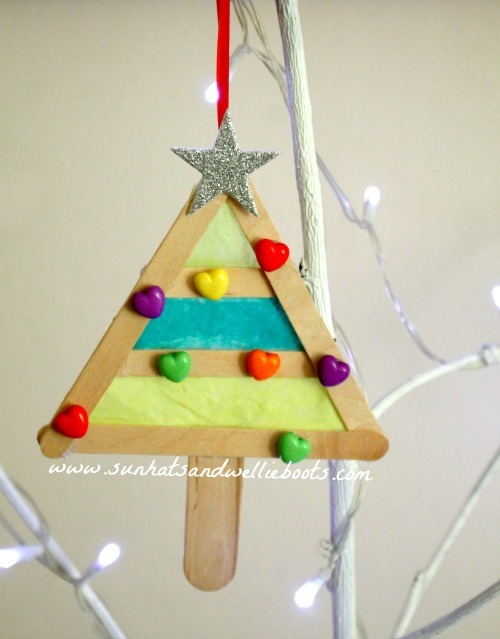 I love how thrifty these trees are to create & how they look so pretty as a Christmas decoration or on a window as a sun catcher. 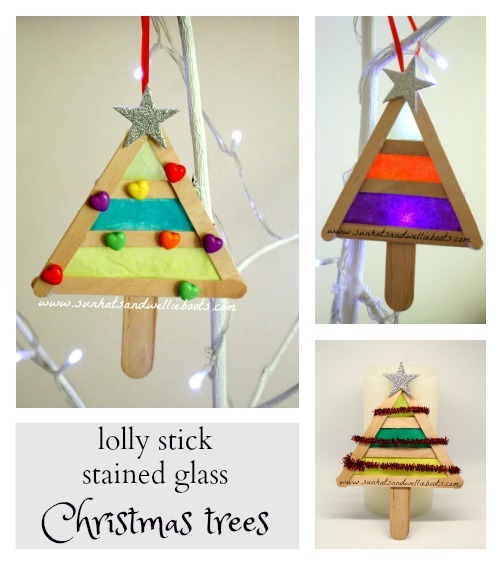 Older children could easily build the tree frame with the lolly sticks themselves, & younger children could freely decorate the ready made frame.